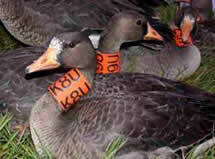 The Greenland White-fronted Goose, a subspecies of the Greater White-fronted Goose, is one of Europe’s rarest geese. The name is derived from its summer breeding range in West Greenland and the white front (‘albi-frons’) on the bird’s forehead. The geese pass through Iceland in summer and autumn, and winter in Ireland and Scotland. They are greyish–brown, with an orange bill and legs. Adult birds have the characteristic white front and black barring on the belly, which varies in extent among individuals. The white front is absent at first in juveniles, but develops gradually over the winter. Juvenile birds also have a black nail on the end of the bill. Traditionally, the species was known as the ‘bog goose’, from the days when their wintering habitats in Ireland were predominantly bogs. They fed in upland and blanket bog areas rich in nutritious plants such as White-beaked Sedge and Bog Cotton. Over time, habitat damage due to activities such as peat exploitation has reduced usage of the bogs by the geese. As these changes occurred, they began to winter increasingly in freshwater marshes and wet grasslands. About 10 to 12,000 geese, half the population of this subspecies, spend the winter in Ireland. They occur in their greatest numbers feeding on agricultural land on the Wexford Slobs. The geese first appeared on the North Slob in 1912 and over the course of the 20th century it has become their stronghold in Ireland hosting at least two-thirds of Ireland’s wintering population. In the rest of the country, flocks are relatively small and range in size from 100 to 750 birds. The Greenland White-fronted Goose was once numerous and widespread throughout the bogs and marshes of Ireland, but due to pressures from hunting, changes in land use and increasing disturbance and development by man, the population was showing declines from the 1950s to the 1970s. A shooting moratorium was introduced on the wintering grounds in 1982/3 and in 1999 the total population peaked at 35,500 birds. However, since then the population has declined dramatically, with approximately 20 to 23,000 birds now left in total. Consequently, a total ban on shooting the geese was introduced in Iceland in 2006. Monitoring shows that the reasons for this drastic decline are linked to their breeding biology. Only a small proportion of birds ever breed and annual natural losses are not being replaced by the production of young. Currently it is thought that changing meteorological conditions in Greenland may be a major contributing factor in the decline. Spring snowfall on the breeding grounds due to milder, wetter winds from the warmer seas of recent years hinders the birds’ efforts to fatten up and produce eggs. Other possible causes include interspecific competition with larger Canada Geese moving further north with the milder climate. Climate change may however, possibly bring some advantages to the geese, as increased thawing could open up new areas in Greenland for exploitation of food resources. There is an ongoing long-term study of the geese, co-ordinated between the flyway states (the countries on their migration routes). At the wintering grounds, the geese are monitored via population counts, age census, and ringing. The data from the distinctive orange collars is used to track movements of individuals, site fidelity (how loyal they are to feeding or nesting grounds), and family relationships. The collar colour fades over time and the collars have no long-term side effects. Satellite telemetry has also been used to track the geese along their migration route to aid in identification and designation of important staging areas for the geese. Four nations, the flyway states of Greenland, Iceland, Ireland and the United Kingdom, support the Greenland White-fronted Goose at different times of the year and share the responsibility for its conservation. The journey of these geese is a testament to their endurance: per annum they clock up a mileage of about 6,000 kilometres (about 3,700 miles), not including short transit flights within their habitats. In flight, the geese can reach speeds of up to 70 kilometres an hour. To accommodate the fuel necessary to complete this journey, their physiology changes dramatically. The body organs become reduced in size and the abdomen becomes visibly enlarged with fat stores. Adult males can burn up to a kilogram of fat (a 3rd of their bodyweight) during their migration. They use following winds to reduce the effort required and time their departures to periods of suitable winds, reaching Ireland on the cold northerly winds that announce winter and leaving again on the warm southerlies that herald the spring. In autumn, temperatures in the northern reaches of their range begin to drop and conditions become cold and harsh, with food becoming scarce. As plant life in Greenland becomes dormant for the winter, the geese will make their way to milder climes in search of other food sources. They climb to altitudes in excess of 3,000 metres (3km) to cross the giant icecap covering 80% of Greenland and make for Iceland. Iceland forms a half-way point and staging area for the next leg of their journey, being roughly midway between their summer and winter residences. They arrive in Scotland and Ireland around October, at which time they will have just completed a journey of about 3,000 km and will be weary and hungry. As the geese are site faithful, they will return to the locations which they have used in previous years and begin to feed and rebuild their stores of body fat. During the winter months, half of the population (about 12,000 birds) winters in Ireland, with the other half in Scotland. In Ireland, flocks of up to several hundred birds can be found in counties Donegal, Roscommon, Westmeath and Offaly. However, Wexford is their most important site in Ireland, hosting up to 10,000 birds. These geese perform a smaller, daily migration in Wexford, departing the open fields at sunset to roost overnight in the comparative security of the sandbanks of Wexford harbour. The movement of thousands of birds en masse against a crimson sky is quite a spectacle. At dawn, they will flock back into the fields of the North and South Slobs, where they spend the short winter days grazing on rye grasses and the roots of buttercups and clover. They also benefit from a diet of root crops which have been specially grown for them as part of their management. Having spent the winter resting and replenishing their stores of body fat, by April the Geese are in excellent condition to make their return journey to the breeding grounds. The lengthening days and rising temperatures signal that their stay in Ireland must soon come to an end for another season. 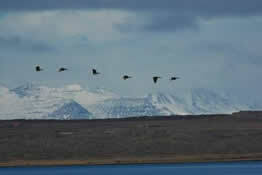 The Geese must retrace their flight back via Iceland to Greenland. The journey to Iceland can take as little as 18 hours. Once in Iceland, the Geese will take some time to rest and refuel on grassland, before moving on again. They will scale the 3 kilometre high Greenland ice cap on the wing once more and make landfall in the areas of the first thaws in West Greenland. When they first arrive in Greenland at the beginning of May, the Geese congregate in flocks of up to 200 birds, feeding on underground roots as the thaw proceeds. Breeding pairs will then split from the main flocks and settle near freshwater marshes and bogs. The nest is a hollow on the ground, lined with vegetation and down. Towards the end of May, the female will lay between four and six buff-coloured eggs, which then take up to four weeks to hatch. The young birds may remain with their family groups for several years. While the parents attend to the young, they begin their annual feather moult, which lasts around 30 days. They rapidly drop the worn flight feathers, and replace them with fresh ones. During the moult, the geese are flightless and vulnerable, so they will take to water to avoid predators. In August and September, the parent geese and their families start to form flocks and join up with other non-breeding geese. By the end of September they are ready to migrate south once more and the cycle will begin again. . .
To support the winter population of Greenland White-fronted Geese, along with internationally important numbers of other wildfowl (e.g. Brent Geese and Whooper Swans) the Wexford Wildfowl Reserve is managed as a working farmland. This is co-ordinated by the National Parks and Wildlife Service and BirdWatch Ireland, in partnership with other land owners and neighbouring farmers. The North Slob produces good quality grass and root crops, which comprise the White-fronts’ winter diet. The grassland is then made available for grazing livestock during the summer, which helps to keep it in suitable condition for when the wintering birds return.